Prokofiev sold his soul for a Shakespeare play. Shortly after Prokofiev had moved to Paris, Stalin lured him back to Russia to become the country’s command composer, with a deal that allowed him to write any opera or ballet that he wished. This would successfully crown him as Russia’s most celebrated composer, particularly after Shostakovich was censured following the premiere of Lady Macbeth. Prokofiev made a first draft of Romeo and Juliet, complete with three exotic dances with some of his most inventive themes and a happy ending that saved two lovers from dying, instead running off to happiness in a faraway land. Stalin heavily censored the ballet, insisting that it conclude according to the Bard, and and insisting upon the ripping apart of whole sections. Up until the 2000s, it was believed that Prokofiev did not entirely mind the changes, until an original score was found with much more to the story. 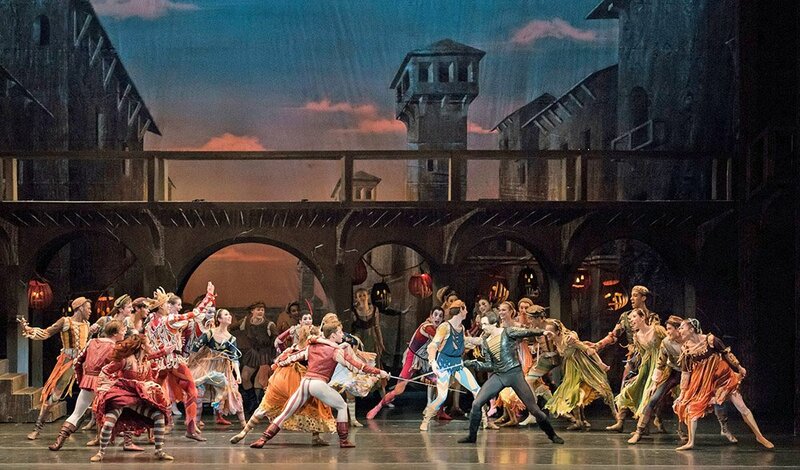 On Thursday, Boston Ballet commenced its Boston Opera House run of a Stalin-approved Romeo and Juliet, adapted for the stage by South African choreographer John Cranko in 1962. The run continues through April 8th. Cranko’s retelling is perhaps the most vivid and transformative of all of the interpretations of Romeo and Juliet. Boston Ballet has previously used this choreography in 2008 and 2011, but this year, the set and costumes were new to this region. Jürgen Rose designed the set and costumes for this production from the 1968 performance in Stuttgart, although he also designed a different set for Cranko’s 1962 premiere. The set was perhaps the most striking part of the evening. Although simple in conception, with a courtyard that sometimes transformed into a bedroom (and later a crypt) and a walkway above, the backdrop and careful lighting (designed by Kevin Dreyer) set the tone for each scene. Most unusual was the dark lighting and gorgeous set used in the moonlit scene where Romeo comes to Juliet’s window. The final scene in the crypt cast a dark shadow over the stage, the focus solely on the downtrodden lovers. Cranko’s choreography cleverly depicts the immature nature of Romeo and Juliet’s relationship, complete with a flirtatious scene at the start between Romeo and another woman, just as lust-struck as the first moment he saw Juliet. Juliet clings to her nurse and plays peek-a-boo with her in a childlike manner, not ready to depart from the motherly grasp of her nurse’s arms. Throughout, Juliet’s unsureness and inexperience is pointedly featured, while Romeo’s choreography outlines his flirtatious and hormonal-driven attitude. Mariinsky resident conductor Gavriel Heine led the evening, offering robust energy to the pit of the Boston Ballet Orchestra. The orchestra followed suit, phrasing some spots with such fury that I found myself constantly wishing for the pit to be elevated for better projection. Brass and woodwinds lead the ensemble to a beefy, resilience. Heine guest conducts until March 25th, and Mischa Santora takes the helm on March 29th until April 8th. Misa Kuranaga portrayed Juliet with innocent expressions, hesitant turns, and childlike excitement. Paulo Arrais played a convincing Romeo, offering flirtatious, boyish charms towards every female character before transforming into the martyr that would only truly love Juliet. Crowd favorite Derek Dunn danced Mercutio. His impressive twirls, humorous head bobs, and tragically-portrayed death scene stole the entire evening. Dunn has been with the company since 2017 and originally comes from Glen Burnie, Maryland. The choreography, thoughtfully conceived, offered a dramatic retelling of the play, complete with gestures that heightened the actions of the scene and emotions of the characters. The most impressive execution came in the form of a gypsy carnival scene in the second act, with expert footwork from the entire company. Arguably the most heart-wrenching but impactful moment came from Mercutio, whose death scene featured an elaborate knife fight with Tybalt (Eris Nezha), humorous coyness with female characters after being stabbed, and slow struggle to death. Romeo’s fight with Tybalt that followed was similarly striking. Although the Boston Ballet brilliantly mounted Romeo and Juliet with a fresh, new set, it would be wonderful to eventually see a retelling of the story as Prokofiev original intended. Boston Ballet revived the production in 2008 and again in 2011; since this story remains in the repertoire, an extended reworking would be a refreshing change to the long-accepted, Stalin-approved number. The original ballet has been retold once with choreography by Mark Morris, premiered in 2008 and performed by the American Symphony Orchestra in New York. Romeo and Juliet runs at the Boston Opera House until April 8th. Ed. Note: This review has been edited post publication. Rachael Fuller is an MIT administrator who has studied piano and music theory. By night, the concertgoer is also a practicing musicologist. Interesting review, but is it true that “Shostakovich was thrown in jail following the premiere of Lady Macbeth.”? I’ve never heard this before. I thought that the opera’s premiere was in 1934, and that it was performed with great success until Stalin attended a performance in 1936. The Pravda editorial denouncing the opera followed immediately, but was Shostakovich ever jailed? No, Shostakovich was never jailed, though there are stories of his sleeping in the hallway so his family wouldn’t be disturbed if he were taken away in the middle of the night. As for this Romeo & Juliet’s being Stalin’s Prokofiev — well, it’s everybody’s Prokofiev, in the sense that the version the Kirov presented in 1940 is the one everybody — apart from Mark Morris — does today. But I don’t know how much Stalin had to do with it. Prokofiev finished the ballet in September 1935 and conducted some of the music from it in Moscow in October. When it got out that he had changed the ending of the play, there was resistance — aesthetic as well as political. On top of that, the Bolshoi, which was to have premiered the work, declared it undanceable. Prokofiev was prevailed upon to revert to Shakespeare’s finale, but for the Kirov performances, it was the choreographer, Leonid Lavrovsky, who, over Prokofiev’s objections, messed with the score, simplifying rhythms (for the benefit of dancers used to 19th-century ballet music) and thickening textures (to make it sound more heroic). I don’t know that Stalin had seen the score or heard the music till then. As far as I know, there hasn’t been a recording of the Prokofiev original that musicologist Simon Morrison reconstructed for Mark Morris, so it’s hard to judge that version of the music against the familiar one. And though it would be nice to see a full-size ballet company dance to that original version, getting the choreography reworked would be a formidable undertaking — I should think you’d have to start from scratch. One learns a lot of Soviet history from this review. Not only was Shostakovich jailed, but Stalin moved to Paris, and later made an attempt at composing Romeo and Juliet! A side of the man I never knew! Apologies – you’re all right. Shostakovich was not jailed. I very distinctly remember a pretty well respected professor of mine telling me that he was, and I made the mistake of taking this as fact. Thank you for your corrections; I’ll take this as a learning experience to keep questioning and considering multiple sources, even if I particularly trust one! Just saw – and every much enjoyed – this production. Would like to understand WHY the ballet enriches the play for me, even though there are no words at all. Some of Shakespeare’s words do come to mind as I watch the dancers, so the words do become part of it. What else can explain why this works? Another thing that intrigues me: For opera, it’s a big question how much staging you actually need. Among the different local companies, we get to enjoy all the possibilities, from period wigs and gestures to straightforward concert performances. With the ballet, you get to see all the possibilities from one company: from very basic leotards and no sets, to full sets and gorgeous costumes like those we just saw. Perhaps this can give a fresh perspective on the role of staging.